First print two copies of Santa Claus page (bottom of this page). Cut all shapes using small scissors. 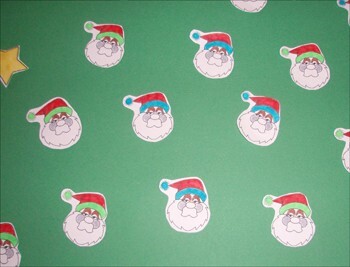 You should end up with 25 Santa's faces (one is extra, as a doble if needed) and 4 evening stars. Color or paint all Santa's faces and stars. 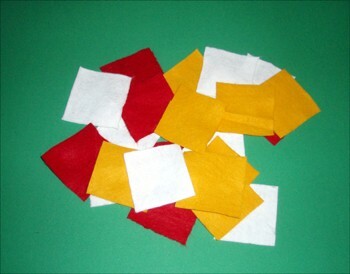 Now cut 25 felt squares of different colors to make the 25 daily gift bags, size 2.5 x 2.5 inches. 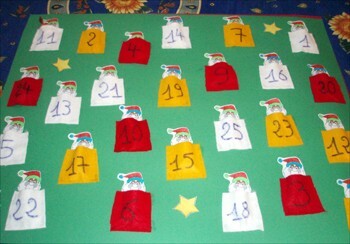 Each felt square gets a number 1 - 25 written on it for each day with a permanent red marker. 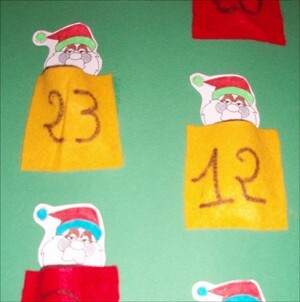 Place 25 Santa's faces on the cardboard, and add a square of felt fabric over each one. 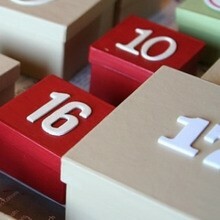 To make your homemade Advent Calendar more fun don't write the numbers in numerical order! Place the 1 number in the top left-hand corner of the calendar, and the 2 in bottom right-hand corner and so forth. Once your calendar map is ready (face + felt), you can glue each gift bag. Santa first, then the bottom and 2 sides of the felt square piece (keep the topside free of glue to be able to slide a surprise inside). Let dry for 1 or 2 hours at least. For the most important day of December, being the 25th, add "Merry Christmas". Glue the 4 stars around your calendar. Use glue to add the multi-colored sequins. Use hairspray on each pocket, spraying at least 10 inches away (otherwise it would leave marks on the cardboard) giving your calendar a shiny look. Wait while the lacquer dries. 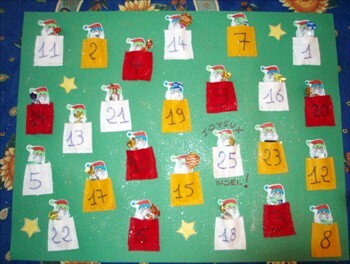 Now hang your advent calendar, and ask your Parent(s) to fill each pocket with surprises you will discover each day of December until Christmas Eve!